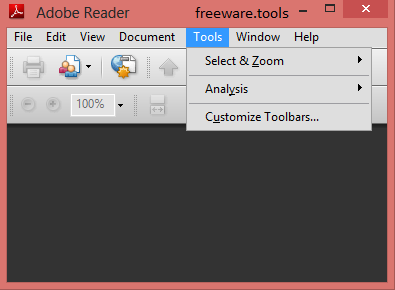 This is a bloat-free portable version of the popular PDF viewer, Adobe Reader. Adobe Acrobat Reader is free, and freely distributable, software that lets you view and print Portable Document Format (PDF) files. The Adobe Portable Document Format (PDF) has been around for about two decades, allowing us users to capture and view all sorts of data, from any program on any operating system and share it with other people from all around the world. Because this is a portable edition, there's no need to install it, therefore no changes are made to your PC when using this tool. Portable Document Format files, commonly referred to as PDF documents, require a special type of application if you want to open them to look at the contents. Such tools are not hard to find, especially since the undisputed leader of this software category is the well-known Adobe Reader. Those who want a slim version of the most widespread PDF viewing utility can now enjoy an edition that goes by the name of Portable Adobe Reader Lite. This app is delivered as a stand-alone executable and needs just a simple double click to be up and running. Of course, the interface is similar to the one of its bigger brother while the functionality is still great, so you won't really feel like missing something if you choose not to install the big Adobe Reader package and use this portable software. The application loads pretty fast, but this depends a lot on the storage device you choose to run it from. Some options like those for signing the PDFs, the security features or the spell check have not been made available for this version but you can still make good use of the rest of the features. It is also worth mentioning the fact that Portable Adobe Reader Lite comes with the extensive 'Preferences' menu that enables you to tweak and customize in detail the running settings of the program. All in all, it's safe to say that with this portable version of Adobe Reader you just can't go wrong. It handles flawlessly the Portable Document Format files and comes with a nice set of functions that complement the basic PDF viewing ability.